Sturdy, mobile stand accommodates H-4185 horizontal sample ejector. Complete with shelf for pneumatic pump and reservoir. Large wheels provide easy maneuverability. Wooden top allows sample ejector to be bolted to it for added stability. Requires longer hoses (included) to reach pump and reservoir. 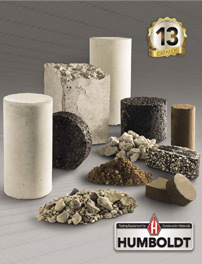 Shelby tubes are used for collecting soils, including fine cohesive soils and clays. Use with H-4202.1 or H-4202.1A Drive Hammers with "E" rod connection. Plastic end caps for protecting tube and sample.